As the Grid team prepares to start a busy week, sending our next issue off to press, I'll remind you that the August issue is all online. 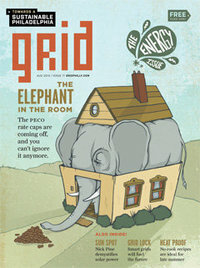 Check out the cover story on the expiration of the PECO rate caps, read about the HBO documentary Gasland and get inspired by Marisa McClellan's no-cook recipes, perfect for the summer heat. And if you're looking for a giggle, click through to peruse Jacob Lambert's backpage essay detailing the "Battle of the Bulb."